Menu cards are not limited for use in dining establishments. In fact, menus are used in most events or occasions that have a dining component even if it is not held in a restaurant. 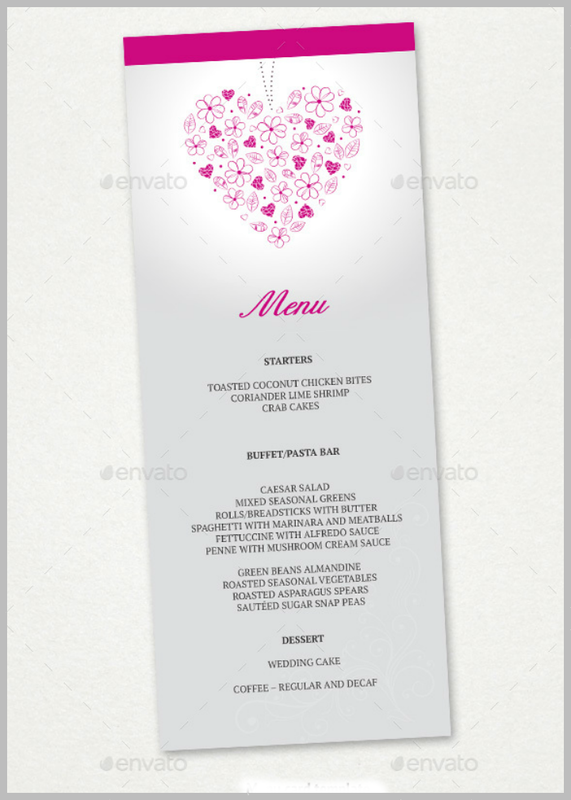 In this article, we provide different examples of wedding menu templates in Photoshop Document (PSD) file format. What follows are 15 wedding menu PSD templates. Feel free to browse through them, find which design best fits your preferences, and be ready to make them your own. The Autumn Lake PSD Wedding Menu Template shown above is not your regular wedding sample menu card template. It follows a gradient watercolor design effect set against a white background. Despite that, this wedding menu template does not look drab or bare. You may customize the text and font colors to match your wedding motif. On top of that, the rainbow background may be adjusted if you want to since it is set up as a separate layer. The image is set to high resolution 300 DPI. This template is also part of a wedding invitation suite that includes matching invitation cards, save the date template, info card, RSVP card, program template card, thank you card, table number, and place card templates. Choose the Chalkboard PSD Menu Wedding Template if you want matching wedding stationery that follows a chalkboard design motif. 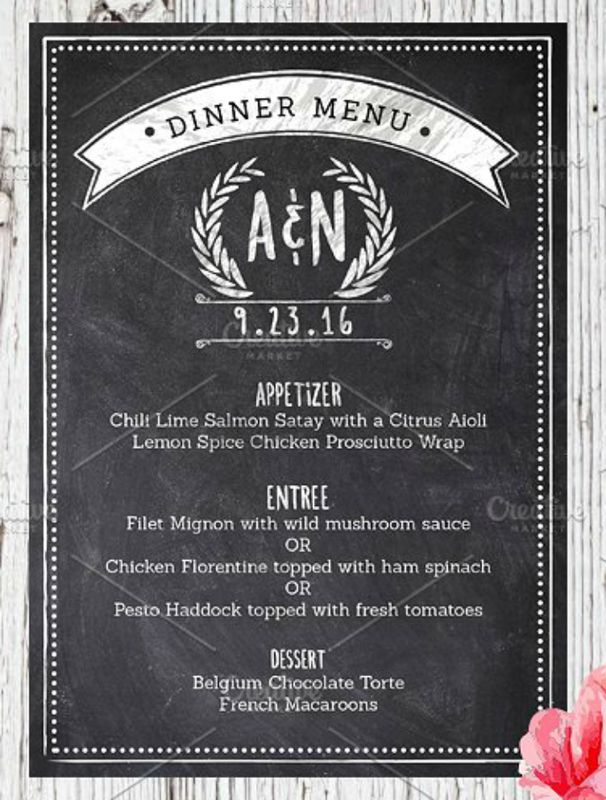 This wedding menu template is best printed out on matte black cardstock or premium paper. The floral patterns placed to frame the menu text may be changed to match your preference. You may change this to the official wedding logo or symbol. 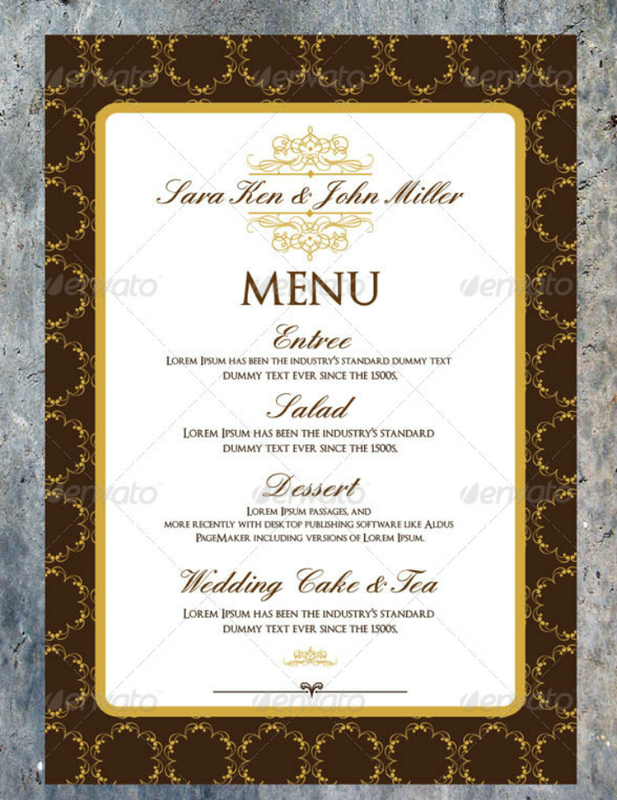 This wedding menu template set is available in CMYK color mode and has a pre-setup 2.5 mm bleed. For those who are planning a traditional wedding, the Elegant PSD Menu Wedding Template pictured above may suit your theme. This wedding template includes a wedding menu template design and a matching elegant wedding invitation template. Both card templates measure five inches by seven inches when printed and have a 0.25 mm printing bleed. The frame colors, text, and text colors may also be changed. It follows the CMYK color mode. The Geometric Design PSD Menu Wedding Template shown above is a good example of a simple yet oddly satisfying wedding template design. This wedding template may suit couples who want a simple wedding but do not want to follow an entirely minimalist wedding theme. 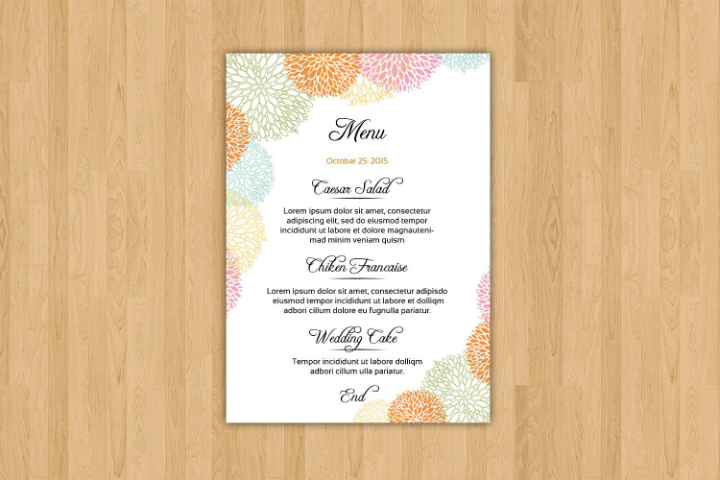 This wedding menu template prints into five by seven-inch card stock or premium paper. To fully transform this menu template into your own, it may be best to create and add your own wedding logo design. Why use PSD menu wedding templates? The Internet is littered with both free and premium menu wedding templates that will overwhelm any wedding planner just by browsing through a single page website. A simple solution to this issue is by narrowing down your choices of wedding menu templates. And this article provides just that with a collection of PSD menu wedding templates. But why, you may ask, should you use PSD templates in creating a wedding menu card? Read on for a list of why it makes sense to use PSD file templates. They are easy to edit. Planning a wedding can be hectic. Even if a couple has hired a wedding planner for this task, the bride and groom may still be required to provide input on all the things related to the wedding. 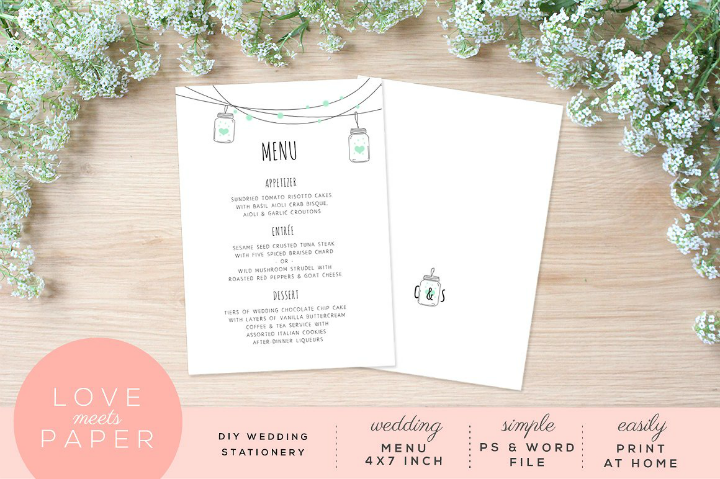 If you want to make the entire wedding preparation process easier, using PSD templates for all your wedding stationery design is a good step to go on. This mainly has to do with the editing aspect of using these file templates. To illustrate, couples who chose a vintage themed wedding would want all their wedding stationery to reflect this vintage theme. Using a pre-made vintage menu design template will reduce the time it will take to customize the template and make it truly your own. Plus, if there are changes to the menu details, it can easily be made on the PSD template without having to create a new template from scratch. To save time. 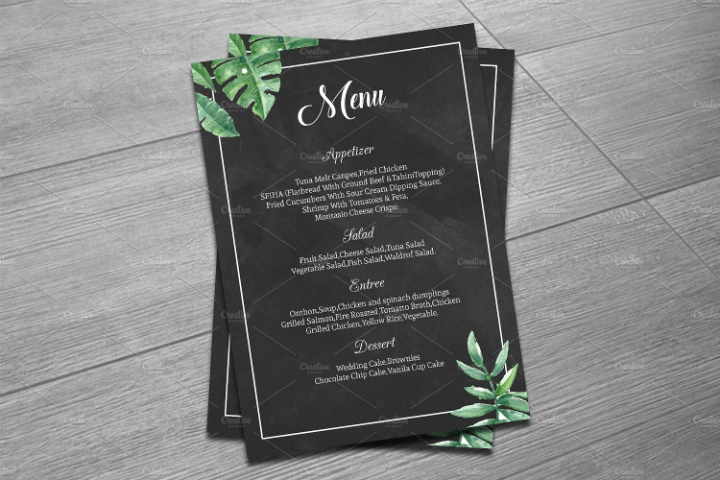 As mentioned in the previous items, using PSD wedding menu templates will help you save time from the menu card design creation to the wedding menu printing process. Even if you are not the graphic designer who manually makes the customizations on the PSD template, your time spent on supervising the designer when making such modifications will be greatly reduced. As the bride and/or the wedding planner, you may use this time on other more important aspects of the wedding preparation process. To reduce costs associated with graphic design. For those who are under a wedding budget, incorporating all the necessary wedding stationery package may be an issue. But if you use PSD wedding templates, the costs associated with these things may be dramatically reduced since you will no longer need to hire a graphic designer. And if you already know how to use Adobe Photoshop, customizing PSD templates will come easier to you. Using PSD templates may also help reduce the cost of manually designing each wedding menu card. With these templates, the steps in creating a menu card are greatly shortened and the costs reduced. To practice Photoshop skills. Another advantage of using PSD menu wedding templates is that they can serve as a way for you to improve your Photoshop and design skills. Even if pre-made PSD templates do not need a lot of tinkering, this is still a good opportunity for you to see what works in terms of design and determine what appeals to consumers. If you are a wedding planner, learning how to use Adobe Photoshop is another skill that will add points to your resume. These files follow industry standards. PSD menu templates are created and stored using the editing and compositing software Adobe Photoshop. Files retain the .PSD file extension name when they are saved using this software program. Adobe Photoshop, as part of Adobe’s Creative Suite, has now become a global leader in digital design and image editing. The different pieces of software that they have created have now become industry standards. This means that if you use wedding menu card designs in PSD, it will be easier for you to collaborate and use the same file template with other graphic designers, printers, and visual artists as they also use the same piece of software. You already have Adobe Photoshop installed on your computer. If you already have the Adobe Photoshop software in your computer or laptop, it will be more practical to use this piece of software instead of installing another software. Also, note that the Photoshop document files may only be opened using an updated Adobe Photoshop software program. There are some software programs that can open a PSD file. However, they will not retain all the editing functions that the original Adobe Photoshop program has. The Minimalist PSD Menu Wedding Template featured above is a perfect example of a minimalist wedding album template design that manages to add touches that is unique to the couple. In this wedding menu template, the couple’s initials or wedding monograms are printed on the decorative mason jar designs on the card. Aside from being editable using Adobe Photoshop, this template will also include another set of files that can be opened using Microsoft word template. With this template, two menu designs may be printed on an eight by 11-inch card stock or on an A4-sized paper. Each printed sheet will measure four inches by seven inches. If you are aiming for a minimalist effect, it is best to print out the templates using plain paper or on pastel-colored card stock. If you want a wedding menu card that is on the smaller size, choose the Rose Gold PSD Wedding Menu Template (shown above) as it only measures four inches by seven inches when printed out. At first glance, this menu template may look like a rack card template. But this one is exclusively made for formal wedding reception dinners. This wedding template will suit most modern weddings that want a touch of luxury and sophistication in all aspects of the wedding. The Watercolor Floral PSD Menu Wedding Template embedded above will match most weddings that want a cheerful vibe for their receptions. This wedding template is filled with big floral accents and bold cursive fonts that all help to create a happy effect just by looking at the menu card design. This menu template is part of a wedding invitation suite and will also include templates for an invitation card, table card, save the date card, RSVP card, thank you card, and place cards. Some of the templates include double-sided printing designs and you may need to adjust your printer settings when printing them out. As with any good wedding template, this one includes image layers that follow a high resolution 300 DPI in CMYK color mode. Plus, all card templates include a 0.25 inches print bleed. 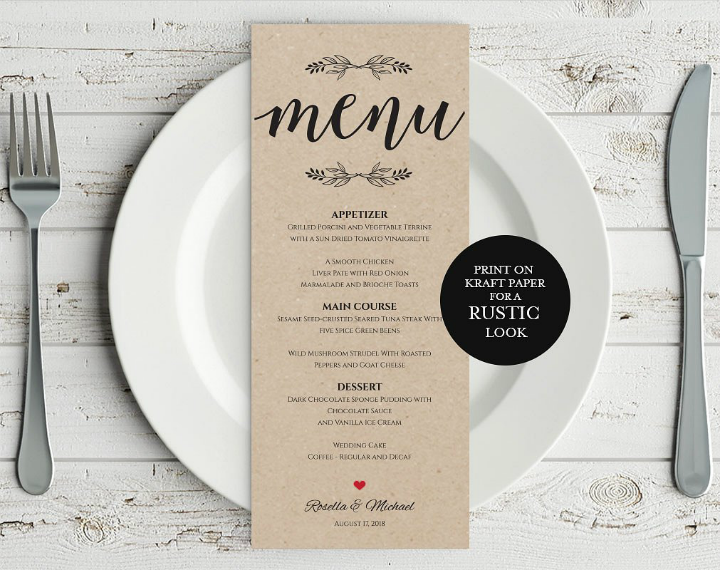 Try out the Wood PSD Wedding Menu Template featured above if you want to a rustic-themed wedding that will match any rustic wedding invitation card designs that you may be using. This printable wedding template will also suit country weddings and destination weddings. 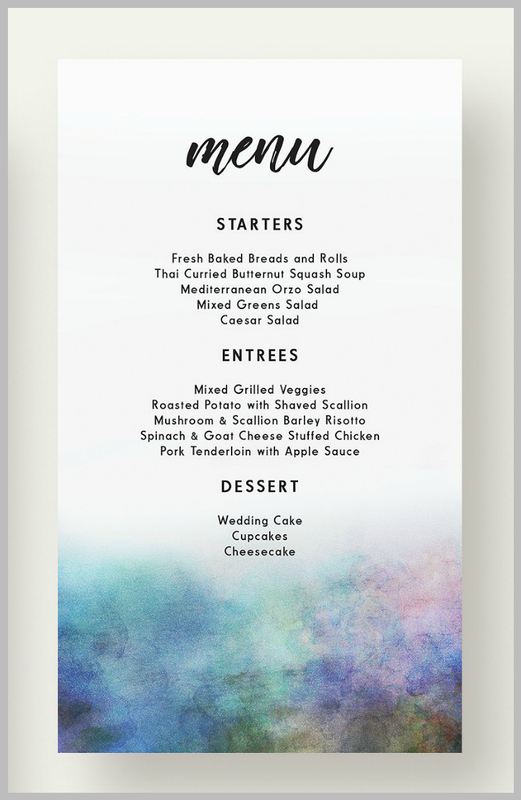 As with all PSD templates, you may easily change the text and text colors to match the specific menu items that will be served during the wedding. The wooden background is locked into the template’s PSD layers so you may not be able to change this easily.